I have been avidly following Aamir Khan's “SATYAMEV JAYTE” since its inaugural episode on 6th May 2012, on every Sunday at 11:00a.m., considered a non prime-time slot. The duration of each episode is all of 90 minutes, without too many commercial breaks, an unavoidable irritant in most episodes. But the interest doesn't wane even a wee bit; and you are moved and struck by the stark reality of the inhumane, unjust and illegal occurrences in our everyday lives. Although touched by every episode I wondered whether this would really lead to anything? Will these occurrences cease? Will the concerned authorities take appropriate action? Or will it be business as usual, with everything forgotten, back to our involvement in the mundane routine of our lives? 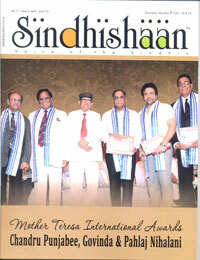 You will find echoes of similar thoughts expressed by Dr. Ram Buxani in his “Rejoinder”, featured in this issue, pertaining to the oft repeated grievances of the Sindhi community at various fora which conclude with lofty action plans and platitudes; only to later leave us wondering – what did we achieve? At every gathering or Sammelan you keep hearing the oft repeated laments . . . Sindhis have been denied justice; no state of our own, no representation in Parliament, no TV channel, no tableau at the Republic Day Parade, no mention on denominations of currency notes, inadequate government support for promotion of our culture, language; and the refrain goes on and on. So why not take a lead and start with the simple issues relevant to our community – propagation of our language. Let us take a pledge to speak in Sindhi at home especially with our children. Let us actively participate in social causes affecting Sindhis – no lip service or speeches full of braggadocio and empty rhetoric, please!